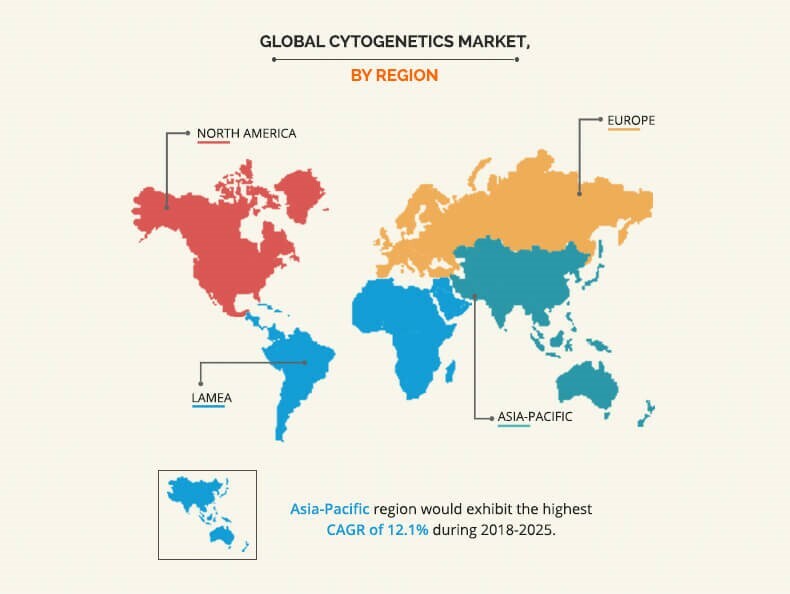 The global cytogenetics market was valued at $1,542 million in 2017 and is projected to reach $3,205 million by 2025 at a CAGR of 9.5% from 2018 to 2025.Cytogenetics is the study of chromosomes present in cell and tissues. This study is further applied in the field of biology and medicine to better understand genetic disorders such as cancer, sickle cell anemia, cystic fibrosis, Down’s syndrome, and others. Moreover, cytogenetics is used in the development of personal medicine, targeted cancer treatment, and others. Currently, a wide range of techniques such as comparative genomic hybridization, fluorescence in situ hybridization, karyotyping, and others are employed for the screening of genetic abnormalities and cancers. These techniques employ the use of cytogenetic products such as kits, media, reagents, and others. The growth of the global cytogenetics market is majorly driven by increase in incidence of genetic disorders and cancer. Other factors boosting the market growth include increase in focus on targeted cancer treatment, rise in aging population, and increase in prevalence of chronic diseases. 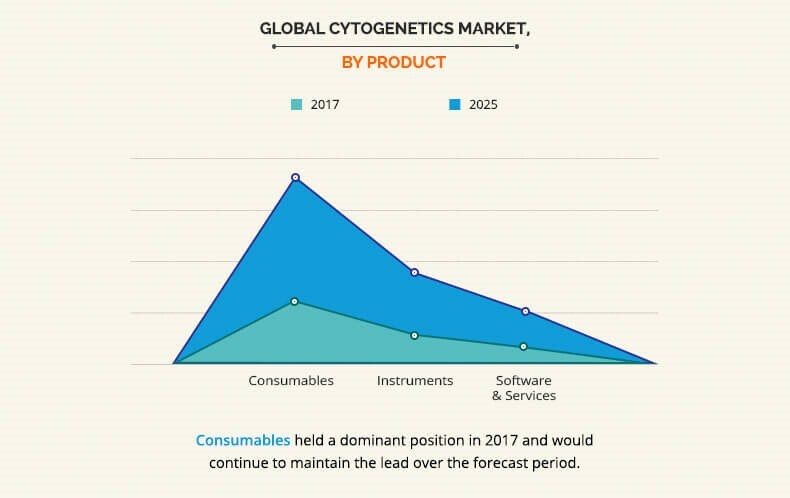 However, high cost of cytogenetic instruments hampers the market growth. Conversely, transition from fluorescence in situ hybridization to array based is expected to provide lucrative growth opportunities for the global market. The global cytogenetics market is segmented into product, technique, application, end user, and region. On the basis of product, the market is bifurcated into consumables, instruments, and software & services. The consumables segment accounted for the largest market share in 2017, and is expected to remain dominant throughout the forecast period, owing to their niche use in developed and developing economies. Furthermore, new launches such as Sysmex Corporation’s subsidiary, Oxford Gene Technology launched Cytocell Aquarius, a cost-effective fluorescence in situ hybridization (FISH) kit for the reliable investigation of glial tumors. By technique, the cytogenetics market is categorized into comparative genomic hybridization, fluorescence in situ hybridization, karyotyping, immunohistochemistry, and other techniques. The comparative genomic hybridization segment accounted for the largest market share in 2017, owing to ease in analysis of thousands of sequences with an extremely high resolution along with detection of single nucleotide polymorphism (SNP). Based on region, the cytogenetics market is studied across North America, Europe, Asia-Pacific, and LAMEA. North America held the largest share of the market in 2017, followed by Europe. On the other hand, the Asia-Pacific region is anticipated to dominate the market during the forecast period, owing to increase in disposable income and enhanced patient awareness about genetic disorder and cancer. Moreover, Asia is a large continent, and has emerged as an epicenter of a large percentage of population. The key players of this market include Abbott Laboratories, Agilent Technologies, Inc., Applied Spectral Imaging, Inc., Empire Genomics, LLC., Illumina, Inc., Irvine Scientific., OPKO Health, Inc. (GeneDx. ), PerkinElmer Inc., Sysmex Corporation (Oxford Gene Technology), and Thermo Fisher Scientific, Inc.
Other players (these players are not profiled in the report and the same can be included on request) in the value chain include Bio-Rad Laboratories, Inc., F. Hoffmann-La Roche Ltd., and MetaSystems. The study provides an in-depth analysis of the global cytogenetics industry with current trends and future estimations from 2017 to 2025 to elucidate the imminent investment pockets. A comprehensive analysis of factors that drive and restrict the market growth is provided. Identification of factors instrumental in changing the market scenario, rise in opportunities, and identification of key companies that can influence this market on global and regional scales are provided. The profiles of the key players and their strategies are analyzed thoroughly to understand the competitive outlook of the market. 9.3. Applied Spectrial Imaging, Inc.
9.10. Thermo Fisher Scientific, Inc.
Cytogenetics is a diverse field of genetics extensively employed for the study of chromosomes. The study of chromosomes help in the detection of genetic disorders arising due to chromosomal abnormalities. Thus, cytogenetics is applied for screening of genetic disorders such as cancer, cystic fibrosis, sickle cell anemia, and others. The growth of cytogenetics market is propelled by rise in incidence of cancer and genetic disorders. 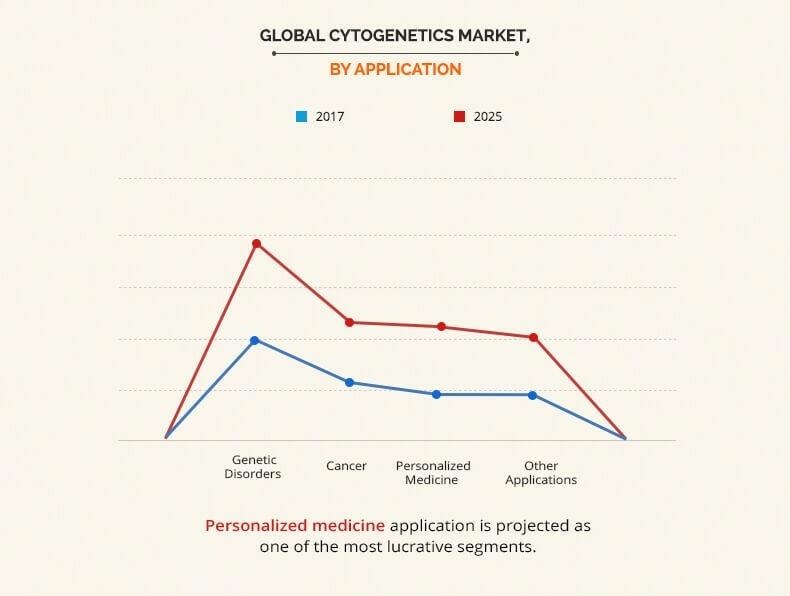 Furthermore, increase in awareness & acceptance of personalized medicines, growth in penetration of molecular cytogenetics in clinical pathological testing, and rise in focus on targeted cancer treatment are the key factors anticipated to boost the market growth in the near future. The use of cytogenetics is highest in North America, owing to efforts taken by government and pharmaceutical companies towards the spread of awareness related to genetic disorders, followed by Europe and Asia-Pacific. 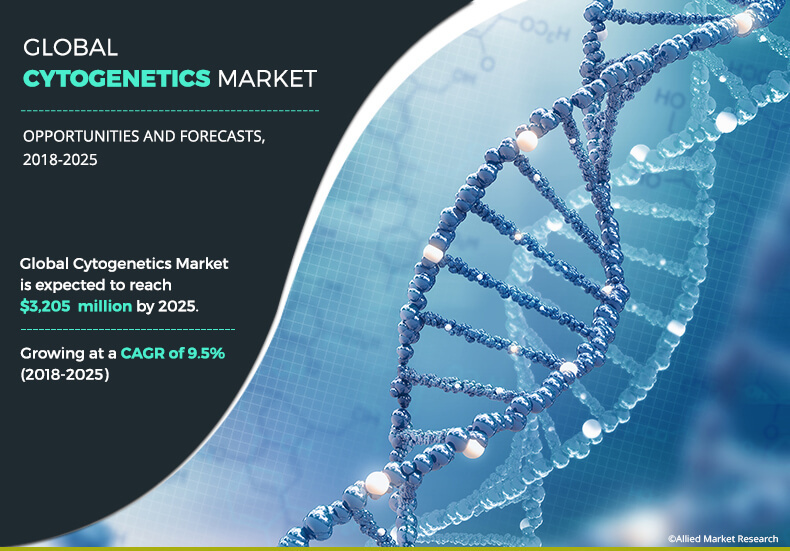 Moreover, rise in prevalence of genetic disorders and presence of most of the major key players in this region contribute towards the growth of the market. In addition, instrument manufacturing companies have focused on expanding their presence in the emerging economies, which is anticipated to drive the market growth.